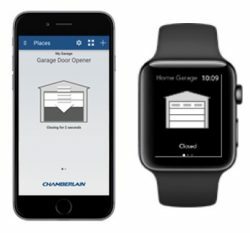 Chamberlain, a connected smart home company that specializes in garage door openers, today announced that it will be introducing Apple HomeKit compatibility to a range of its connected smart home devices. For users already using the company's products in the "MyQ" ecosystem, they will be able to gain HomeKit support through the addition of a new MyQ Home Bridge. For new users, Chamberlain will launch the all-new Smart Garage Hub, a device that can add smartphone controls to "virtually any brand of garage door opener" that users already own. Thanks to HomeKit compatibility, users will be able to control their garage door -- and any MyQ connected lighting accessories -- through their iPhone, iPad, iPod touch, or Apple Watch, and even use Siri. Additionally, Chamberlain announced new Smart Light Switches and lamp controls, as well as new features within the MyQ mobile app, including guest accounts and scheduling abilities. On iOS, users will be able to add Touch ID onto the app's startup to ensure an additional layer of security is protecting access to their garage door and lighting controls. The company said that the MyQ Home Bridge should arrive by April 2017, and the Smart Garage Hub will launch around July 2017. The MyQ Home Bridge will run at a special introductory price of $49.99 (regular $69.99), but there was no mention of how much the Smart Garage Hub will cost. im a big fan of my MyQ garage door and the app on my phone. i replaced my opener with a MyQ one just a few weeks ago. ******** i would have to buy a new home bridge to work with home kit. They have been saying for the last year or so that they'll add homekit functionality to their products through a software update. I know that's impossible, but they've been saying that all over social media, and now have been deleting their posts (LINK) ('https://myqcommunity.chamberlain.com/chamberlainmyq/topics/homekit-promises'). Chamberlain tends to over promise and under deliver. Out of interest, what value is there in the AppleTV being a Homekit hub, if each manufacturer has to sell you their own Homekit bridge? The AppleTV HomeKit hub is necessary to access your accessories remotely through Apple's Home app. In other words, without the hub you can only access HomeKit accessories when your at home or via the vendor's apps. They do. The AppleTV is the HomeKit hub. I'll admit I'm far from an expert on this. As I understand it, the AppleTV allows you to access you HomeKit devices when you are away from home. Essentially, the AppleTV is an always-on "server" that bridges the connection between wherever you are out and about, and your local home network. Without the AppleTV, you would only be able to connect to HomeKit devices while you are on your home Wifi network. From what I understand, and someone correct me if I'm wrong, most Homekit devices don't actually have to have their own proprietary bridge. It's an either/or scenario - you can use HomeKit or you can use their proprietary thing. Some HomeKit devices do require you to use their own bridge, but it is because the actual things don't support traditional wifi for some technical limitation, and thus use some proprietary system. For example, in some of the lighting systems its inefficient or not cost effective to put a full-blown wifi radio in each bulb, and thus a bridge is used to send signals over power lines. Also, the term "bridge" has been a misnomer in some situations where it is really rather an add-on module. For example, with garage door openers, often the actual mechanical opener itself is a dumb device and can be expanded to have smart capabilities with an optional plug-in expansion module or card or box of some kind. This is not so much a bridge as it is the actual HomeKit device. On another related note, I've been following the s***-storm over at Chamberlain's forums for roughly the past year. Some not too happy customers about this news today. Rightfully so. Telling their customers publicly that they'll get a free update for homekit, and then charging $50 for it isn't ok. Some of these IoT devices are just ludicrously stupid to me (WiFi hairbrush??). But the WiFi connected garage door opener actually seems super practical. When I have a garage door, I will definitely plan on getting a HomeKit-compatible setup.